If you’re looking for expert Moodle consulting services, our team here at Titus Learning has decades of combined experience. Are you looking to start using or get more from Moodle in order to save time and moneyfor your department, and improve learning outcomes for your students or staff? We have training and educational technology consultants who all have extensive experience of working with and advising on the best use of Moodle to create learning platforms that deliver on clients’ goals – across a wide range of sectors. Working closely with you, we’ll draw up an e-learning solution design that incorporates each thread of your brief, and lays out how the final system could look. Titus Learning is a Certified Moodle Partner. This means that our company is endorsed by Moodle HQ as a provider of high-quality Moodle services. 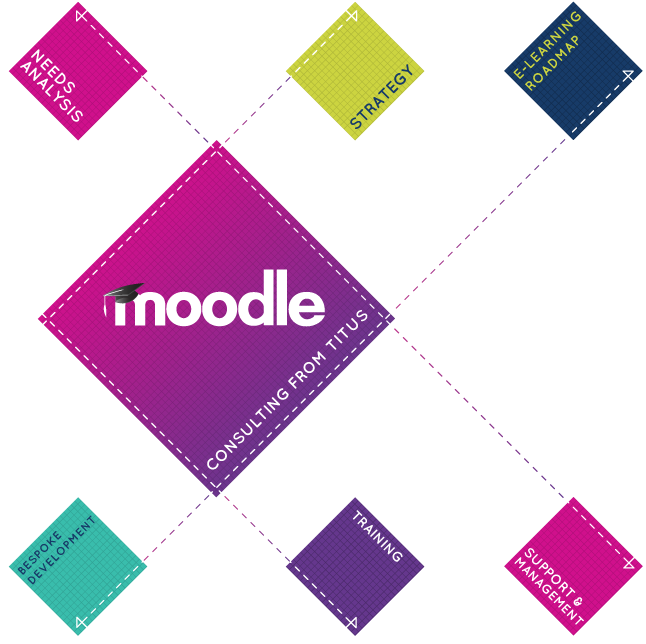 We can become an extension of your teaching / training and administrative teams, working to make Moodle integrate seamlessly with your existing processes and IT systems. However, when everything is up and running, and your team is happy and confident in using Moodle to manage learning materials and learner progress, we take on a supporting role – giving you the knowledge and tools you need to manage the system with as little (or as much) assistance as you want. As with any IT-related project, we understand that the success of a project to introduce or reshape how you use e-learning and Moodle depends largely on the way it is discussed, planned and implemented, rather than the technology itself. User buy-in and understanding of how to use the technology is key. We can liaise with stakeholders at all levels to ensure that all users are engaged and understand the potential cost and time savings, the learning outcome benefits, and how it can be used to make their roles easier. Our e-learning consultants are backed up by our team of in-house Moodle developers, designers and user experience (UX) experts. Our team members have been working with Moodle, and even contributing plugins and advice to the Moodle community, for an average of 10+ years. We’ve supported businesses, schools, colleges & universities, not-for-profits and public sector organisations across the globe to benefit from the open source freedom and flexibility that comes with using Moodle. Why get in touch to see how our Moodle consulting services can help you too?